The Aboriginal workforce is young and ready for work, an untapped resource compared to other areas of the Canadian workforce which are predominantly nearing the retirement phase. Being informed about the communities your company’s projects may impact will help your bottom line and allow you to make better business decisions. 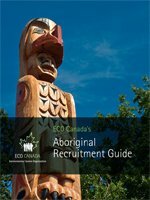 An Aboriginal employment strategy will help you find qualified Aboriginal professionals and build long-lasting relationships with Aboriginal communities.